Hair is beautiful, but it can also be a mess ? and we're not just talking bed head. Who doesn't wish they could make hair disappear from unwanted places? It can help us reclaim control of our self-image. Shaving, tweezing, and plucking can become expensive and time-consuming, and waxing hurts. Can anybody make laser hair removal permanent? No, but Dr. Cabrera and his skilled team of skincare technicians come pretty darn close with their innovative Forever Bare BBL™ treatment. BroadBand Light (BBL)™ heats the upper layers of your skin, stimulating your tissue to regenerate. When this intense pulsed light is applied to your unwanted hair areas it reveals the beautiful skin underneath. Then is tightens your pores for a smooth, silky finish. This revolutionary, non-invasive hair removal treatment is generally comfortable, fast, and safe. If you're tired of dull razors, clumsy tweezers, and messy creams, schedule a consultation with a Genesis Health Institute specialist today by calling (954) 561-3175 or contacting us here. Forever Bare rapidly delivers pulsed light to gently heat your hair follicles, which stops them from growing hairs. Because this treatment is direct and localized it does not harm any surrounding tissue. At Genesis Health our light delivery device features thermoelectrically-cooled sapphire crystal on the end of the hand piece, which continuously cools your skin throughout the session. This delicate heating and cooling strategy enables Forever Bare to balance your body temperature and perform hair removal for all skin types including type 5 (dark brown skin, hair, and eyes). Speak with your hair removal technician to craft a custom plan that works for your body, your skin type and your schedule. 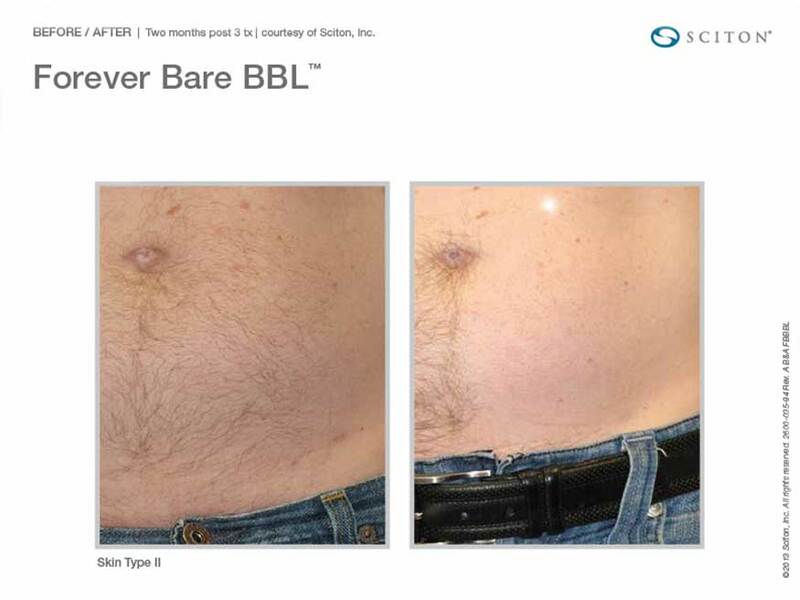 What happens during a Forever Bare BBL Treatment session? To begin your BBL™ therapy, a clear gel will be applied to your skin. You'll also wear safety shields or glasses to protect your eyes. If you are receiving the therapy on your face, do not wear makeup during your appointment. While a topical anesthetic is generally not necessary, your specialist may recommend it for sensitive skin areas. The BBL energy is then delivered with an applicator tipped with a cooled plate so there is minimal or no discomfort. During the treatment, you may experience a warm or stinging sensation in the treatment area. If you are concerned about your sensitivity, discuss this with Dr. Cabrera before your treatment. Treatment time will vary depending upon the size of the area treated and your hair and skin type. Typically, a smaller area only takes a few minutes while a large area can take 15 minutes or longer. What Results can I expect from a Forever Bare BBL Treatment? BBL™ laser hair removal has virtually no downtime. In most cases, you can immediately resume your normal daily activities and wear makeup again. You should avoid direct sun exposure and wear sunscreen. Follow your specialist's aftercare plan until your skin is completely healed (which may take about a week). You may experience some redness for a few hours. Within a few days or a week, your hair will begin to fall out, though it may initially appear as though your hair is growing. Your treated skin will also look clearer, and your pores tighter. Most patients require about three to five treatments over the span of two to six months at four to six-week intervals. This is because BBL™ mostly affects hairs in the anagen phase, also known as the active growth phase. Since not all hairs are in the same growth stage at the same time, multiple treatments are necessary for the most effective hair removal. Long-term results depend on skin type, hair thickness, size of treatment area, and hair growth cycle. Am I a Candidate for Forever Bare BBL? Generally speaking, anyone with unwanted hair can benefit from Forever Bare therapy, however, we don't recommend it for the very young or very old. This treatment doesn't work well on severely loose skin. If you suntan regularly we recommend you allow your tan to fade completely before undergoing Forever Bare treatment. Because the sun changes your skin's melanin, you may require a more powerful laser treatment. During your consultation, talk with Dr. Cabrera about any medical conditions that you may have or medications that you may be taking. How much does Forever Bare BBL cost? Forever Bare is not covered by medical insurance. BroadBand Light™ therapy cost varies depending on geographic location and the number of sessions required for your hair type. Speak with our specialists to determine your cost. Don't deal with one more bad hair day. Forget the hassle of shaving, waxing, and plucking. BroadBand Light™ Forever Bare therapy offers quick and comfortable hair removal. To schedule your first appointment, call Genesis Health Institute at (954) 561-3175 or contact us here.